By Zack Quaintance — March 2019 felt like a momentous month for new comics, launching as it did a number of series that seem destined for long runs. We will, of course, discuss all of these books in depth below, but let me just note now that a month is pretty significant when it launches series like Invisible Kingdom, Assassin Nation, and Little Bird, with some of those coming out on the same day! And that’s to say nothing of one of the best series in all of comics, Lazarus, returning in a new format with a new #1 as well. In fact, I don’t remember a month with so many great new creator-owned books since...well, since last March. That’s right, this is becoming a trend. Last March we got Gideon Falls and Oblivion Song on the same day. It felt special then and continues to feel so now. So yes, you get it—March was strong, which makes it easy for us to compile this list of Best New #1 Comics for March 2019. Now let’s get on to the books! Ronin Island #1 from BOOM! Studios is that oh so special creator-owned comic that gets announced as a limited series and then immediately turned into an ongoing because it found its audience. Meanwhile, the best superhero universe in comics right now blazes into other genres with Black Hammer ‘45 #1 (read our full review!) while at the same time remaining true to its central concept. 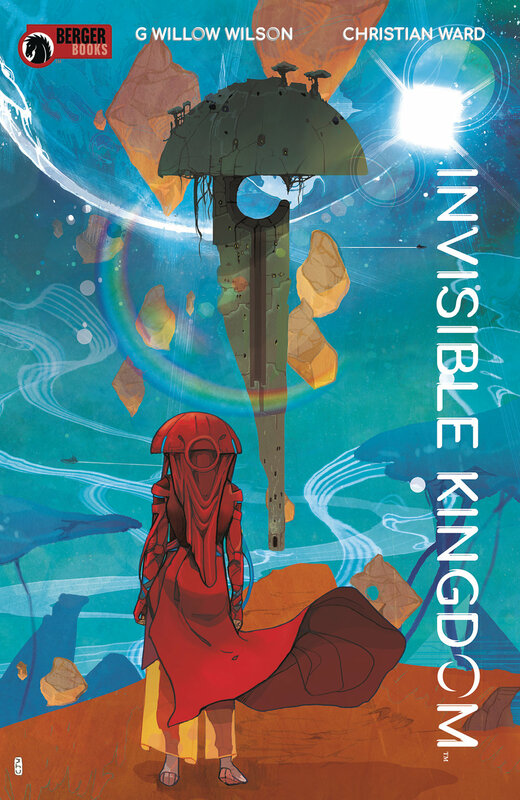 As far as wholly new ideas, Invisible Kingdom #1 (read our full review!) was one of the most interesting and imaginative we’ve seen in some time, blending high-concept sci-fi with striking psychedelic imagery. Elsewhere on the interesting original ideas front, is Dark Red #1 (read our full review! ), which couldn’t be more different from Invisible Kingdom. This comic imagines a lone vampire working at an all-night gas station in rural America, rich ground for commentary. The start of Marvel’s Age of Conan: Belit, Queen of the Black Coast #1 (read our full review!) miniseries was a solid one. The clean and bright artwork is a bit at odds with the brutalist setting, but it works to set this book apart from the rest of the line. Jury is still out on the ultimate execution. Morning in America #1 (read our full review!) was rich with realistic and unflinching teen banter, plus an intriguing paranormal mystery. Speaking of teen banter, Kamala Khan and her friends didn’t miss a beat, transition to their first new creative team ever in The Magnificent Ms. Marvel #1 (read our full review!). What we especially liked about this one is how it seems poised to give the character a more substantial mythos. GLOW #1, meanwhile, was a fun comic book adaptation of one of our favorite original Netflix shows. Dial H for Hero #1 was also a blast to read, doing what the young Wonder Comics imprint does best—taking long-tenured existing DC Comics concepts and revitalizing them by injecting just a bit more levity than we’ve seen in the recent past. Finally, while there’s not all that much levity to be found in Life and Death of Toyo Harada #1 (read our full review), it is one of the most satisfying and complex shared universe reads in all of comics right now, a smart book if ever there was one. Thus far, Marvel’s Age of X-Man event has been an interesting experiment, one that takes a number of X-Men characters off the board while the main Uncanny X-Men title tells a more streamlined State of the Mutants sort of story. It all harkens back to the Age of Apocalypse setup and concept. It’s a fine event, but the breakout book of the bunch for me has easily been Prisoner X, an intensely character-driven story that follows Bishop as he is disciplined for breaking the NO LOVE rules of this alternate reality. Vita Ayala is one of the best young creators in all of comics today, and they’re at the top of their game once again here. Technically, the second issue of this book came out in April, but having read it, I can still attest here that this comic is headed to some interesting places that seem bent on exploring the nature of consciousness (at least, I personally hope so because I love that stuff). I’ve been saying this for a while, but Kyle Starks is one of the funniest writers in all of comics. On Assassin Nation #1, he’s paired with artist Erica Henderson, who is coming off a lengthy run on another very funny title, The Unbeatable Squirrel Girl. Within this first issue, it is immediately evident that their sense of humor are going to gel, with the duo putting out an engaging story about killing people that somehow has a ton of charm. Everything from the character names (David Bowie Knife, F*ck Tarkington) to the concept (a retired assassin hires a bunch of current assassins to protect him from assassination) is great fodder for comics. Also, as one might expect from these creators, there are great visual gags and entertaining touches throughout. It seems odd to say this in regards to a story of contract killing, but this is the sort of sunny book that’s likely to leave you in a better mood than when you started. Monster hunter books have been increasing in frequency in comics as of late. This is a good thing, seeing as all of the ones I can recall off the top of my head have been very good. 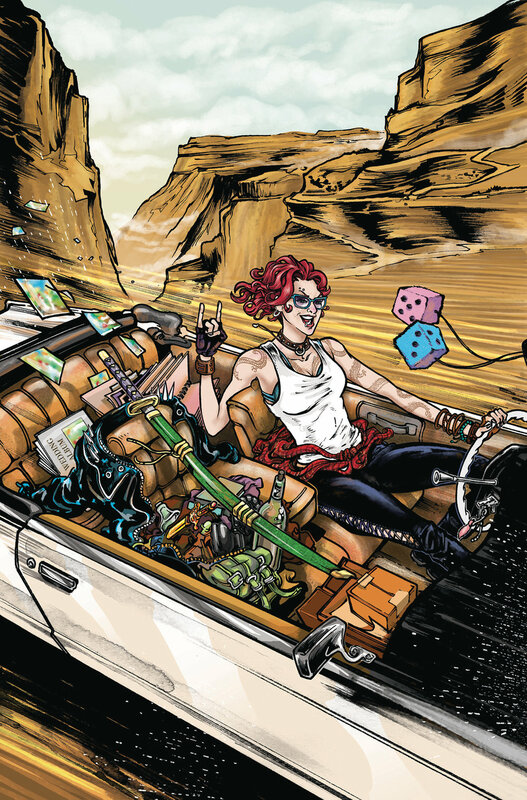 And Calamity Kate is certainly an entertaining adventure comic about hunting monsters. It’s more than that, though. What sets this book apart is that it’s also an interesting character study of the eponymous main character that relies heavily on her relationship with a long-time friend. Add to that some expert world-building (Monster Hunters are as famous as Instagram influencers in this book), and you’ve got a really strong start to an interesting new comic. I’ve been heaping praise on all things Lazarus this month as if it were my job. But what can I say? I really love this comic. In fact, I think it’s up there with Saga and Monstress as one of the best to come out of the creator-owned comics boom in recent years. It’s a complex book that scarily extrapolates some current political trends into a new world order. Now, it’s back in a new quarterly format. The results of this switch are evident in this first issue. The creators clearly have more space and time to play out patient story beats, and they use them well. Lazarus fans (a group of which I’m at the front of the pack) will be satisfied. And if you haven’t read this book yet, I strongly recommend doing so. With only 28 (I think) previous issues, it’s not nearly as intimidating as series like Saga or Wic+Div. Little Bird #1 is a rare sort of debut comic. It’s the first chapter of a much longer story, and yet, it’s so good that I’ve been moved to praise it basically without reservation, without the usual caveat of, Hey now, let’s wait and see where this one is going. The reasons for my bullishness on this one are essentially twofold. First of all, Ian Bertram’s artwork is detailed and stunning, cut from the same lineage as Frank Quitely, yet still entirely its own. Indeed, Bertram is a massive talent and he’s been cut loose to explore very corner of his imagination here. Second, this is one hell of a compressed comicbook, one that packs in so much story it almost harkens back to a different era when periodicals were written without any sort of consideration for the eventual trade. Simply put, Little Bird is the best debut comic of the year so far.